Customer: "I've been doing risk analysis by hand for five years, and we finally got your program so we could do it automatically -- but there's a bug in it. The answers come out differently each time." 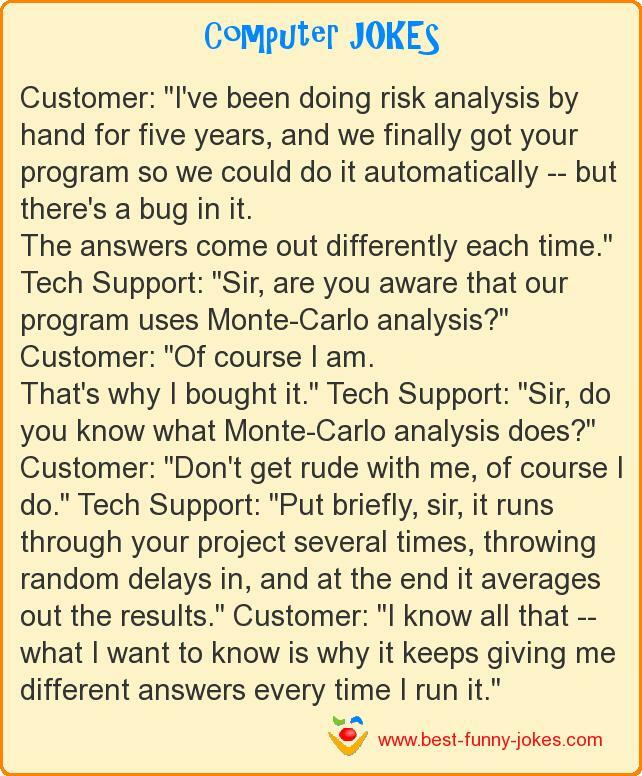 Tech Support: "Sir, are you aware that our program uses Monte-Carlo analysis?" Customer: "Of course I am. That's why I bought it." Tech Support: "Sir, do you know what Monte-Carlo analysis does?" Customer: "Don't get rude with me, of course I do." Tech Support: "Put briefly, sir, it runs through your project several times, throwing random delays in, and at the end it averages out the results." Customer: "I know all that -- what I want to know is why it keeps giving me different answers every time I run it."